Susan Ward. (2015). ADHD & Sensory Integration Disorder. สืบค้น ธันวาคม 2558, www.livestrong.com. วิฐารณ บุญสิทธิ. (2555). โรคสมาธิสั้น: การวินิจฉัยและรักษา. วารสารสมาคมจิตแพทย์แห่งประเทศไทย, 57(4), 373-386. Pediatrics. (2001). Clinical Practice Guideline: Treatment of the School-Aged Child With Attention-Deficit/Hyperactivity Disorder, Volume 108/Issue 4. สืบค้น กันยายน 2560, pediatrics.aappublications.org. Lynn J. Horowitz and Cecile Rost. (2004). 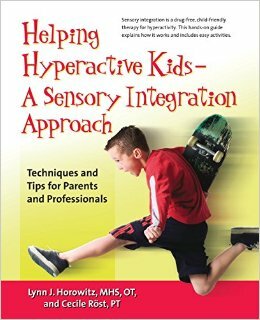 Helping Hyperactive Kids-A Sensory Integration Approach. Nancy Konigsberg. (2011). Sensory Integration Techniques for ADHD. สืบค้น มกราคม 2559, adhdmomma.com. สร้อยสุดา วิทยาการ. (2550) . ออทิสติก: ปัญหาที่พบในแต่ละช่วงวัย วิธีการคัดกรอง การประเมิน และการบำบัดรักษาทางกิจกรรมบำบัด: ภาควิชากิจกรรมบำบัด คณะเทคนิคการแพทย์ มหาวิทยาลัยเชียงใหม่. Sidney Chu, Frances Reynolds. (2007). Occupational Therapy for Children with Attention Deficit Hyperactivity Disorder (ADHD). British Journal of Occupational Therapy, Vol 70, Issue 10. The SPD Companion, Issue # 021--The Wilbarger Protocol For Sensory Defensiveness. (2007). สืบค้น สิงหาคม 2557. sensory-processing-disorder.com. Bundy, Lane & Murray. (2002). Sensory Integration: Theory and Practice second edition. Mary Sue Williams, Sherry Shellenberger. (2008). How Does Your Engine Run: The Alert Program for Self-Regulation.